MONDAY, Jan. 26, 2015 (HealthDay News) -- A new study supports the notion that thyroid disorders can cause significant reproductive problems for women. The report's authors believe that testing for thyroid disease should be considered for women who have fertility problems and repeated early pregnancy loss. The research, published Jan. 23 in The Obstetrician & Gynaecologist, found that 2.3 percent of women with fertility problems had an overactive thyroid (hyperthyroidism), compared with 1.5 percent of those in the general population. The condition is also linked with menstrual irregularity, the researchers said. "Abnormalities in thyroid function can have an adverse effect on reproductive health and result in reduced rates of conception, increased miscarriage risk and adverse pregnancy and neonatal outcomes," said study co-author Amanda Jefferys in a journal news release. She is a researcher from the Bristol Center for Reproductive Medicine at Southmead Hospital in Bristol, England. While the study couldn't prove cause-and-effect, one expert in the United States said he wasn't surprised by the findings. "For over two decades now, we have noticed a strong link between hypo- and hyperthyroidism and infertility as well as adverse pregnancy and neonatal outcomes," said Dr. Tomer Singer, a reproductive endocrinologist at Lenox Hill Hospital in New York City. "I support routine screening of the general population for thyroid dysfunction at the start of pregnancy and especially when seeking fertility treatment or struggling with miscarries," he added. 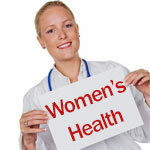 Hypothyroidism (underactive thyroid) affects about 0.5 percent of women of reproductive age. In children and teens, the condition is associated with a delay in reaching sexual maturity, according to the researchers. In adult women, hypothyroidism is linked with menstrual problems and a lack of ovulation in some cases, the new study found. "However, with appropriate screening and prompt management, these risks can be significantly reduced," study author Jefferys added. Singer agreed. "Over- and underactive thyroid condition are very common in young otherwise healthy women, and the current recommendation by the American College of Obstetrics and Gynecology is to start screening at age 35." He said that in his clinic, he performs routine blood tests looking for thyroid trouble "on every patient presenting with recurrent pregnancy loss or infertility." "Thyroid disorders can prevent patients from ovulating and is one of the leading causes of irregular menstrual problems," Singer explained. "The treatment is simple and safe and results in resumption of the menstrual cycle within weeks." He added that, "the treatment is safe in pregnancy and includes taking one pill a day, which is adjusted by the patients' weight and is monitored by a simple blood test." Another expert agreed that thyroid issues often help cause problems with female fertility. "Both overactive and underactive thyroid can have significant effects on reproductive function," said Dr. Alan Copperman, director of the Division of Reproductive Endocrinology and Infertility at The Mount Sinai Hospital in New York City. "Treating even minor disease may improve the chance of pregnancy, may decrease the miscarriage risk, and may improve the health of the baby," he said.